The Workhouse Boys in the musical “Oliver” said, or sang, it best (albeit a bit hungrily),“Food, glorious food!” We humans love our delectable delights. Americans spend, on average, between $144-$175 per week, just to keep our tummies filled and taste buds tantalized. Some love food so much that they are compelled to write about it, sharing their oral experiences with anyone who will listen, or read. And many of us base dining decisions around the opinions of our go-to food writer. Restaurants may have a love-hate relationship with food writers, but consumers often trust their words, especially when it comes to spending their hard-earned money for meals. Let’s inspect the menu for a career as a food writer. Essentially, a food writer eats and writes about what he or she has eaten. Although, it’s more complicated than it sounds. The food writers have to tear apart what they ate and create an essay or a critical examination based on the cuisine, and it goes deeper than whether they liked it or not. They get into the nitty-gritty, from presentation, to taste, to the entire dining experience. They are freelance writers out on assignments, whether they pitched the story or it was pitched to them. 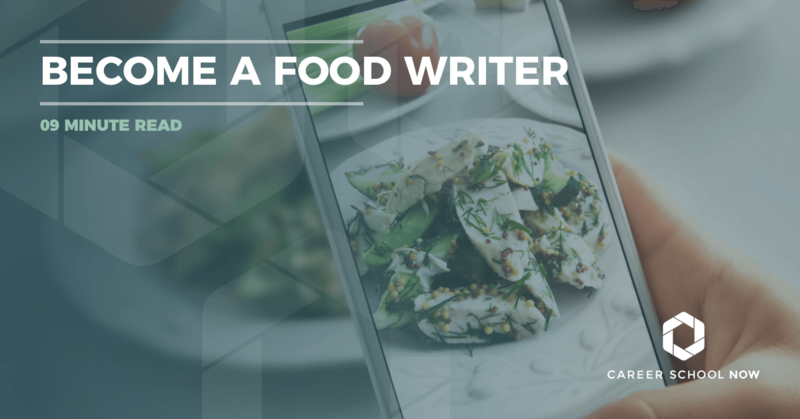 Some have degrees in journalism or culinary arts, and others are just great writers who are lucky enough to have found a way to combine their passions for food and writing. Make no mistake, this is a highly competitive field, especially nowadays where blogs outweigh traditional media (some would argue that blogs are now the new traditional media). Other related careers to consider, or maybe add to your repertoire, are restaurant critic, culinary author, or food and nutrition writer. Combine all three, and you’re winning in the game. Food writers don’t necessarily just focus on food; they may also write about drinks, or the chef creating the chef-oeuvres, aka masterpieces, or any other aspect of the food industry. They may also do a restaurant review. Some specialize, focusing on the appetizers, desserts, food trucks, or food sensitivities. Dream it up, and be it! Sometimes it can help when you have a particular niche, especially if it isn’t as inundated as the main genre, food writing. Being a food writer can be an incredibly rewarding and fulfilling career. Sure, your opinions are going to be met with some haters, but haters gonna hate. And, you may have to eat and drink too much, but hey, a little exercise can help combat the potential weight gain. However, the positives of the game completely overshadow the negatives. Food expense: Ok, so you may have to cover the cost of your own meals. At least, until you get an established name for yourself. Once that happens, restaurants may invite you to dine on their tab, and magazines may give you a budget to hit up some of the local restaurants. Discoveries: Because you are eating all different types of foods, you’re broadening your horizons. You may find your ever-expanding palate pleasing. Connections: The world of food writing is quite cliquey. But, you’ll find yourself among like-minded people, and who knows what can happen! Travel: Maybe you won’t be doing any international traveling, but you’ll get to discover different areas where you live. That’s pretty awesome. Praise: Sure, there will be some people who will send you hate mail. BUT, there will be many more adoring fans who take your critique of a restaurant as gospel, and soon the restaurant will be singing your praises for sending them so many happy diners. Degree decorated or not, the business of being a food writer can be a hard one to break into. There are almost 3 million blog posts published to the nearly one billion websites daily, and that’s including articles written on your large outlet platforms like HuffPo and New York Times. You get the picture. You have to be able to stand out, or you’ll unfortunately get lost in all the Internet noise. Light Up Your Senses: If you want to write about food, then you need to train all your senses to work in tandem. Go into a market, pick foods up (probably fruits or vegetables are your best bet). Touch, feel, and smell them, and maybe even buy something to take home and taste. In the meantime, you’re taking mental or actual notes. And then, write about it. Relive that experience, maybe even bringing in the way you felt at the market. Did you feel silly, standing there practically being intimate with a kiwi? How did this exercise make you feel? Did it affect how you felt about that piece of produce? Use your words to draw the reader in and sympathize, laugh, drool, or feel whatever emotion you’re trying to evoke. Emulate Your Idols: Read everything, whether it’s online or in hard copy. Pick out some of your favorite foodie writers and modify their approaches to fit yours. Don’t copy what others are doing but inspect what they are doing to make a name for themselves. What works for one person won’t necessarily work for you, but there’s no reason you can’t take bits and pieces of different advantageous traits, and paste them together to create your game plan. Be Curious: Ask a ton of questions. Talk to other experts in the field, whether it’s another writer, or a chef, or patron. Talk, ask, and listen. The more you know and understand, the more compelling and impactful your words will be. Many writers are curious by nature. They need to know and understand the five W’s of the world around them in order to create a picture. This sort of curiosity will only help you when writing about food. Also, for every meal you eat, read a book on the subject. Expand your palate and your mind! Be A Blogger: Or, at the very least, start a blog to house your own reviews. Consider it your online portfolio for potential clients to view your works. There are platforms where you can start your own blog for free: Look into Wordpress and Blogger. Both are very user-friendly, even for non-techs and computer illiterates. And, don’t discredit food blogs. Some are so fortunate that the owners can focus on it as a full-time business. Make sure to include a page with external links to all your published pieces. Write What You Know: Readers aren’t oblivious. They can tell when a writer has no clue what he or she is writing about, which inevitably translates to a loss of credibility and readership—and in turn, a loss of income. So, if you know macaroni and cheese, but know nothing about the nuances of French cuisine, then specialize in restaurants that serve gourmet mac n’ cheese, and there are a ton of those places these days. YUM. Say Goodbye To A (Food) Comfort Level: You know that show with Andrew Zimmern where he will eat just about anything placed in front of him? That’s going to be you, should you choose to accept this mission. You’ll have to try everything and anything. Even if it’s the tiniest little bite. Hey, it’s expected from you in this gig. If you’re going to review a new restaurant specializing in exotic gastropub fare, you have to try those monkey brains topped with goat toenail clippings and write about it. Realistically, because you can start a blog, you don’t really need a degree to be a food writer or critic. However, to write for most major publications, you’ll probably be required to have a certificate or degree. Most aspiring food writers opt for either a culinary or journalism degree. But hey, it’s not a bad idea to have some sort of background in both. You can also get some of the necessary education by interning with one of the food magazines; many do bring in interns. There really is not set an educational path toward a food writer career. Many have forged their own way, through a myriad of non-garden variety trails. Caution, many forks (and knives, and spoons) lay in the road ahead. The International Food Blogger Conference brings together foodies, writers, and tech. The annual conference is in the 9th year and going strong. The International Association of Culinary Professionals is entering its 40th year. The website also hosts resources for those in the industry. The Association of Food Journalists hosts an annual conference and also is a great resource for food writers. There are international conferences like LitFest in Ireland and Food Writing For Food Lovers (which sounds fabulous) in Italy. There are many conferences specific to bloggers, such as BlogHer Food, TechMunch, and Eat, Write, Retreat. It doesn’t matter your experience or level of expertise; there’s a conference for you. There is a lot of chatter centered around the salary, or the alleged lack thereof, for food writers. The fact is, many food writers make a sustainable living, getting paid handsomely from big name magazines like the New Yorker, New York Times and all their subsidiary magazines, Bon Appetit, and Food and Wine, along with many others. The pay scale is quite diverse, ranging from in the low $20Ks to over a six-figure income for the well-seasoned writer. Their livelihood is dependent on factors such as how influential they are, how well they write, and what outlets are hiring them. Employment opportunities are looking to be stagnant over the course of the next few years. Many factors are weighing into this, mainly the oversaturation of food critics and writers hitting the Internet. But, that doesn’t mean you shouldn’t try, even if it’s just starting your own food blog and working on making it popular. Many have started out in this fashion, only to go on to achieve success beyond and alongside their blog. If you want it badly enough, you’ll make it happen!